If you would like to be added to our email list for the upcomign season, please fill out the CONTACT LIST FORM. 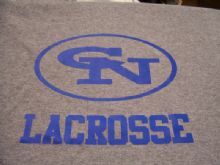 T shirt with Columbus North Lacrosse logo. Long and short sleeve available.